Alright, I haven’t kept it a secret. I’m on board with this ketogenic low carb high fat lifestyle. 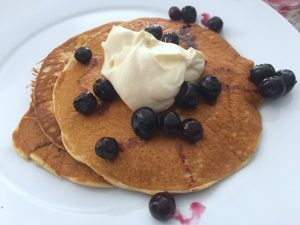 I feel great not eating a lot of carbs and I wrote about how much weight I lost doing the keto diet here. Regardless of what you want to eat I guarantee that you will want to make this. There’s no lack of taste here. These keto cheese taco shells are amazing. 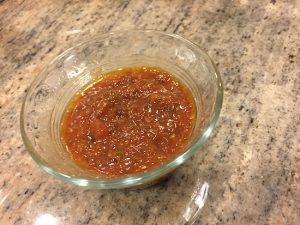 This is a great way to change up taco night. Check this out and let me know what you think! This is so simple. I find it works best with a simple bag of Mexican shredded cheese blend. Grab a plate with some parchment paper, a bag of Mexican blend cheese, two cups and something to hang the cheese taco shell on. The general plan is to take a bit of shredded cheese and place it on the parchment paper. Then microwave this for 1 minute 30 seconds. After the microwave step quickly transfer the hot cheese taco shell over top of the wooden spoon (or whatever you use to hang the shell). Carefully bend the taco shell around the wooden spoon before it solidifies. I had some leftover sliced steak so I made keto cheese taco shells with sliced steak, shredded lettuce and sour cream. 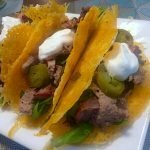 This is not only an amazing way to make tacos, but it’s a low carb keto friendly way to make taco night. You can also make little cheese chips by microwaving smaller circles of cheese. An easy low carb way to make cheese taco shells. Cut parchment paper and place shredded cheese on top. Microwave for 1.5 minutes. Cheese will start to burn. Place crisped cheese over top of wooden spoon using the parchment paper to transfer. Form cheese taco shell by shaping it over the spoon. And below this article on the Related Posts sections, I see : Leftover Smoked BBQ Brisket Subs !! Darn!! 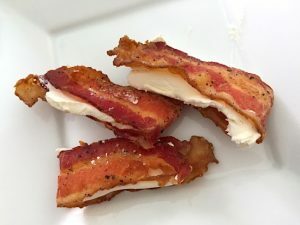 Anyway I am on the keto diet too since your first post about this method. I think it’s going pretty well. I am not hungry and I feel more energetic throughout the day. Waiting for the weight loss, too. Best wishes from your fan in Greece! Awesome! Let me know if you have any questions, I’ve gotten pretty comfortable with this and am still doing well.